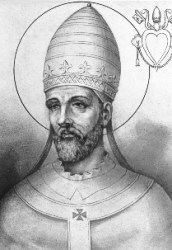 Today is the feast day of Pope Saint Martin I. We remember his outspoken declaration of the Truth against Monothelitism. His refusal to remain silent against the wrong resulted in his being abducted by Emperor Constance II and the Pope died a friendless death in exile. He did not forget to pray for all people to be saved despite his hardships. He remained faithful, and did not lose his passion for Christ despite his extreme loneliness. All may have forgotten him in his exile, but Christ didn’t. Pope Saint Martin was surely accompanied by the Lord during his lonely years. Once he had suffered all that he did, he was finally united with Jesus for whom he freely gave his life. It is recorded that upon leaving for his exile in Chersonese (now Crimea), he told his weeping companions in captivity the following. So today, we rejoice with him for he has completed his path of faith and for he stayed faithful till the end. Pope St. Martin, pray for us that the Lord may sustain our faith against any hardships and trials. Pray for those who are abandoned, neglected and left alone. Help us become faithful servants to bring Jesus to those who are enduring the state of the extreme loneliness. We ask through the power of our mighty Lord Jesus Christ. Amen. I did not know about Pope St. Martin. Thank you for sharing his story. I did not know that either but I was so moved by his life that had to share what I have learned. I can only imagine the loneliness he must have felt but it is evident that the suffering has deepened the relationship between him and the Lord. How beautiful!